Leaves color green in round or heart shape with five lobes. Flower edible color yellow, there is female and male flowers, female bigger than male flower. Fruits color white, green, yellow or yellow with green stripes that create like zebra pattern, bottle, round, oval or round-top, weight can be 2-10 Kg and size 15-50 cm. Seeds are white and edible after cooking eat or sauce. 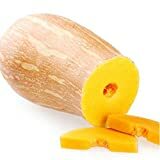 15 Seeds of Cushaw Squash -MASSIVE Squash Make great PIE'S! 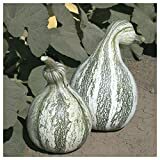 What can be done with big quantities of Cushaw Squash fruits?